The idea that the spiral baffle plate heat exchanger is based on the idea that the fluid in the shell side of the shell side is in a continuous spiral flow by changing the layout of the shell side baffle plate. 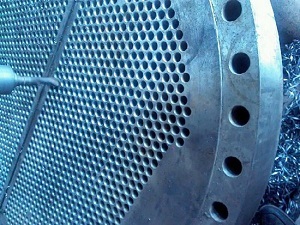 Therefore, the ideal baffle plate should be arranged as a continuous spiral curved surface. However, it is difficult to process the spiral curved surface, and it is difficult to realize the coordination of the heat exchange tube and the baffle plate. Taking into account the convenience of processing, the use of a series of flat plate (called spiral baffle) instead of curved surface connection, the shell side to form an approximate spiral surface, so that the shell side fluid generated approximately continuous spiral flow. Generally speaking, for the processing considerations, a pitch of 2 to 4 pieces of baffle plate, the adjacent baffle plate between the continuous lap and staggered lap two ways, according to the flow channel can be divided into two types of single spiral and double helix.